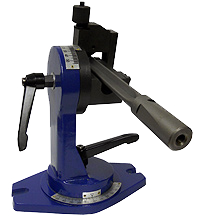 The Sterling Gun Drills manual regrind fixture provides a fast and easy method of resharpening gun drills and half round drills with the popular facet style grind. Drills of a large diameter range are positioned and ground without the need of expensive bushings or collets. The universal nature of the fixture allows standard or custom regrinds. The Workhead with clamping device to hold either a single flute gun drill or half round drill in position. A Scale, graduated in degrees, to allow the drill to be aligned in the vertical plane. This scale is mounted on the vertical member of the fixture that holds the workhead. A Scale mounted on the diamond - shaped base of the fixture to allow the drill to be angled in the horizontal plane. This scale is graduated in degrees. Both scales have locking levers to maintain vertical and horizontal positioning, and when used together allow compound angles to be ground on the nose of the drill mounted in the workhead. The fixture is normally used on a tool and cutter grinder equipped with a 11V9 or 11A2 style diamond wheel (120 - 180 grit). Some may chose a metal or plated bond wheel with concentric roughing and finishing faces, the roughing face having a coarser grit than the finishing faces. The spindle of the grinding wheel will start at 90° to the table slideway. Place the fixture on the table of the machine. The base of the fixture has two through slots that clamp the base to the table. Install two through bolts but do not tighten. Position the horizontal (base) register at zero. Indicate front face of the fixture zero to the table movement then tighten the through bolts. Select the appropriate clamping blade for the drill type. The angled blade is to "V" flute gun drills, ensuring the "F" mark on the blade is toward the front. The flat blade is for half round drills. Store the unused blade on the tapped hole provided on the base. Slide the gun drill or half round drill under the blade clamp and forward of the "V" base. Lock in position on the tube only with the carbide tip fully clear of the base and blade clamp. With both horizontal and vertical scales set at zero, the drill's flat cutting surface should be parallel to the table. Grind the drill by following the steps outlined for the most common grinds. Custom nose grinds can be ground to your requirements. It is recommended that a suitable dust collection system is used. A cold gun or spraymist is recommended for large diameters. Keep up on our always evolving product features and technology. Download our literature.